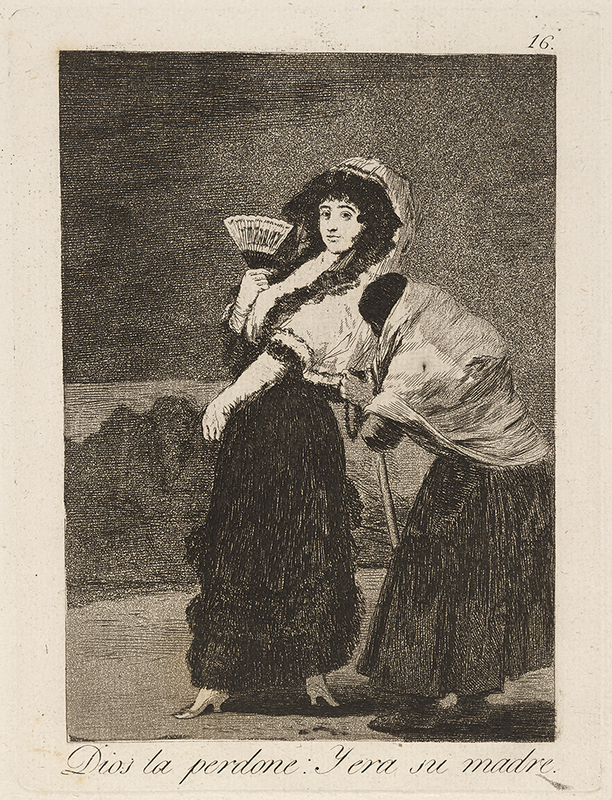 Edition: First edition, 1799; the false biting below the "e" in "madre" was effaced before the second edition, and is seen in this impression. Bibliography: Tomás Harris 51; Loys Delteil 53 iii. Dios la perdone: Y era su madre. (For heaven’s sake: and it was her mother.), . From Los Caprichos. Etching, aquatint, and drypoint. Plate: 196 x 148 mm (7.7 x 5.8 in.). DAC accession number 1946.D1.40.16. Gift of George W. Davison (B.A. Wesleyan 1892), 1946. Open Access Image from the Davison Art Center, Wesleyan University (photo: R. Lancefield). http://dac-collection.wesleyan.edu/obj6323 is a persistent link to this page with no user-session information.